the real stars of the show: those fabulous vehicles and the awe of the miniature effects execution (which was a major influence on the work done on 2001: A Space Odyssey). 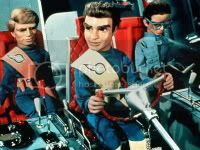 For fans of the show, it's OK.
Keep your Power Rangers and Ninja Turtles, I'll stay with Scott, Virgil, Allen, Gordon and John Tracy, plus Brains and Lady Penelope, of course. They help make up the International Rescue team, which uses state of the art (circa 2056) equipment to save people in danger. Hard to believe this film is over 40 years old. Watching the 90-minute movie boggles my mind at the skill the creators had with not only marionettes (that even sweat), but also the storylines and fast-paced action. With humor, action, suspense and even a little hint of romance that would be spoofed years later in Team America by the South Park team. This one's definitely reserved for those who are looking for a cool movie shot in an alternative medium. So get off of your "I'm too cool" high horse and enjoy this fun film. Such a long winded film. This film takes so much time showing you unnecessary things. With much tighter editing and a shift in the story it probably would have been enjoyable. There a neat cameo by Cliff Richard Jr. and the Shadows, with an interesting dream sequence, that's the highlight of this film.